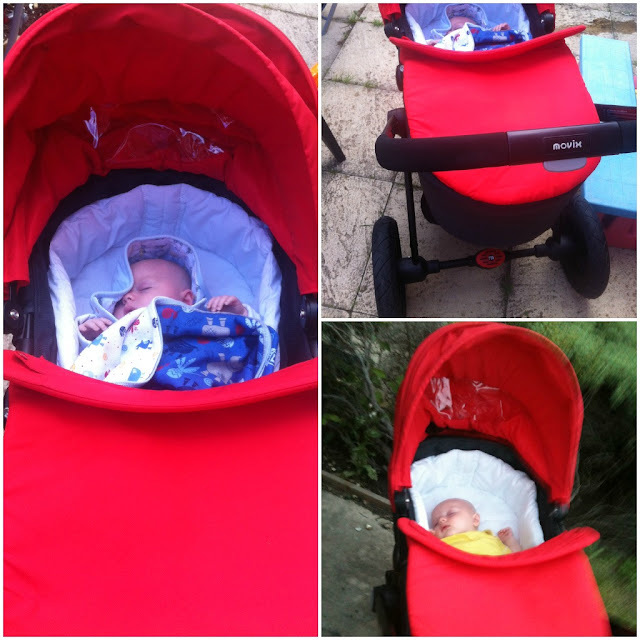 Dylan’s at the age where he’s perfect to review prams which you can use right from birth. He was sent the Mothercare Movix to try out and give it a ride to see what we thought about it. Now the Movix comes in different packs and the ability to have different colours. The first and main section is the Mothercare Movix Base Pack which includes the chassis and the carrycot base and comes in a choice of two colours – dark grey or vanilla. 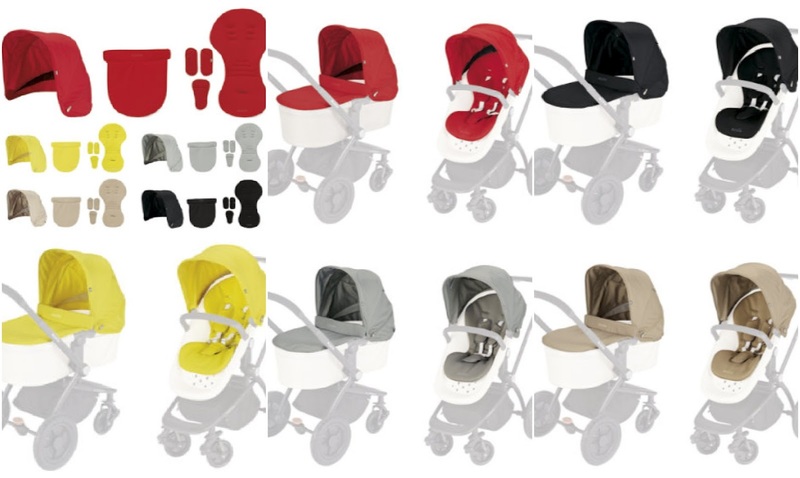 The second pack is Mothercare Movix Nesscity Pack which includes the large hood which has a covered viewing window, sun visor and optional ventilation. Carry cot apron. Cushioned seat pad. Comfy harness pads which attach securely to the harness and helps to keep the seat pad and cosytoes in position.A carrycot rain cover and pushchair rain cover. The different color choices are cherry pop, ebony, citrus punch, pebble and hazelnut. And the third pack being the Mothercare Movix Comfort Pack. This includes the snug cocoon style cosy toes which have a cosy fleece lining; the cosy toes have hidden magnets in the front which ensure that it can be neatly secured over the bumper bar. A matching changing bag which has lots of pockets and a changing mat. Again this comes in the choice of colours of cherry pop, ebony, citrus punch, pebble and hazelnut. For Dylan, we picked the cherry pop as we thought a nice bright colour would look fab for the spring/summer season. Of course, if we wanted a change of colour that’s easily done by buying another one of the packs, I guess that’s why Mothercare have created the Movix. Switching colours and having the ability to mix and match is not something I’ve come across on many prams. As he was still so young when we started to use the Movix, the carrycot was the option we went with, so we put the pushchair chassis to one side until he hits six months. When putting the pram together we came across a problem with the hood, our original hood wouldn’t fit onto the carrycot so we had to get in contact with customer services who sent us a new one which did fit. Putting the actual pushchair up and a down was a breeze once we had got the hang of it, what did take a while to figure out was putting the carrycot together but then I guess it depends on your ability on how to read instructions to how simple this is for you. Putting the other accessories from all the packs were no problem at all, the carrycot apron zipped onto the carrycot with ease and the carrycot rain cover fits quite nicely into the basket underneath the pram with room to spare for other items. The location and the way the basket is closed are ideal compared to some baskets I’ve been faced with on prams in the past. This basket is done up with a zip which is particularly handy when you’re going up and down kerbs and stops whatever is inside of it from jumping out. The basket is right underneath the carrycot which leaves it not that noticeable to other people and lets you keep your items dry. The carrycot is a decent size which will certainly last until they grow out of it. That was a previous issue for me with the toddler and his first pram as he grew out of it long before he ready to move on to the next stage. Though this could be just me giving birth to lanky boys. The hood which also transfers over to the pushchair provides adequate shade for baby. 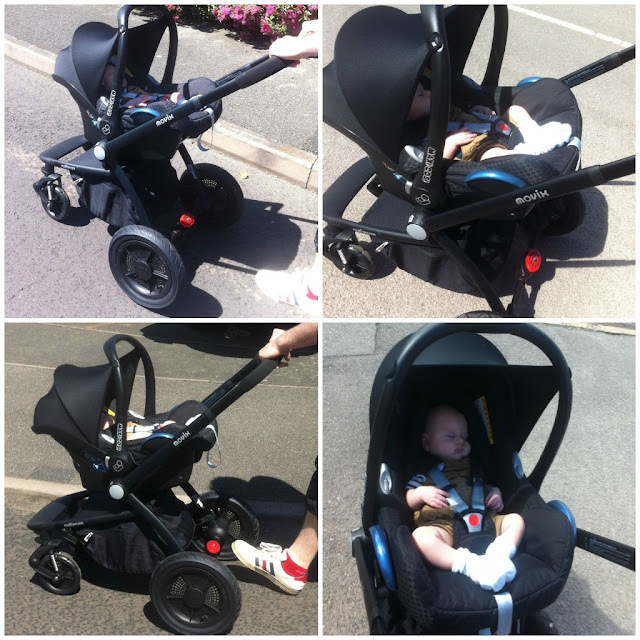 Handling of-of the pram is smooth enough, the tyres make going up and down curbs hassle free. The wheels are lockable which could be handy if you wanted to rock baby in a straight line back and forth. It has a break which is rather obvious to see and works with a simple push on/off way. One of my favourite features to this pram for me is the fact you don’t have to buy extra adaptors to add on a car seat. When you take the carrycot off the pram is already set up to add on the seat, all you have to do is just move the attachments which hold both the carrycot and the car seat to the right settings, but this is simple to do by pushing down and placing in the right mode following the arrows. When Dylan is older is can be transformed into a pushchair which has the bonus of being both forward and parent facing. I’m not a huge fan of the looks of the airflow pushchair seat, but I can see this being a great feature in the summer when it comes to keeping baby cool and it can easily be wiped clean. I did sit the toddler in it to how much room he would have at the age of 3, and it seemed to room him nicely, so the Mothercare Movix really could see you through those newborn days to the toddler stage. The husband dislikes it simply because he likes the height to our other pram, the fact that baby isn’t close up by us. But then this is just another factor you take into account when buying a pram, and if that’s not something that bothers you, then the Movix can be a fantastic pram for you. He does however like the adjustable four position handle with its comfy grip and the ability to make it an easy to push the pram. 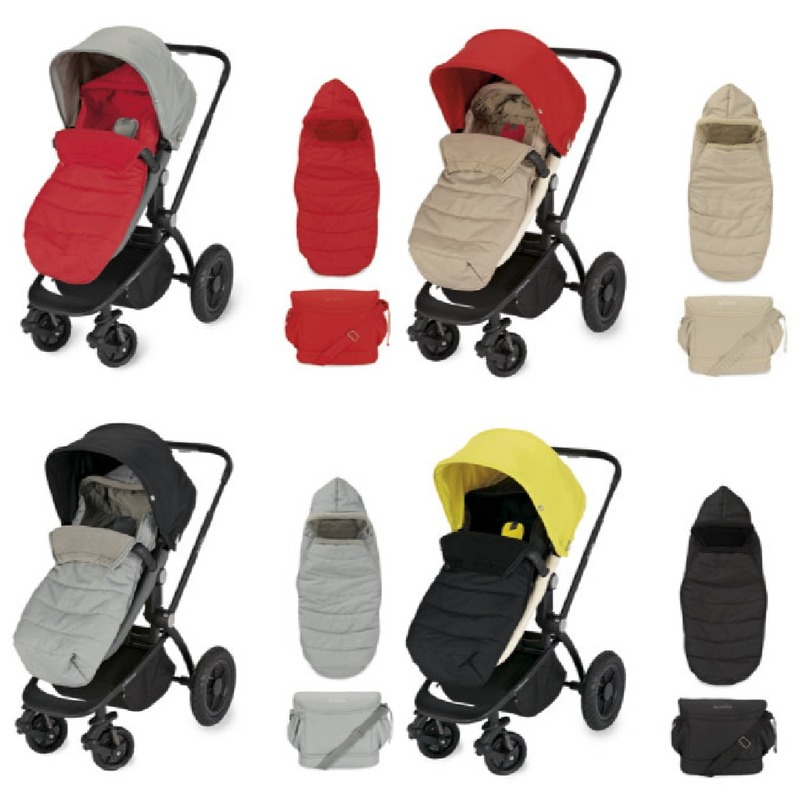 I think the total price of £570 for all the packs is a great deal when you take into account the price of other prams which don’t come with a foot muff and changing bag (with changing mat) which means this is often bought separately adding extra expense. The fact that you get pretty much everything you need to see you through your whole pram experience for the next few years for that price is a bargain. Prices and colours are all correct at the time of posting.